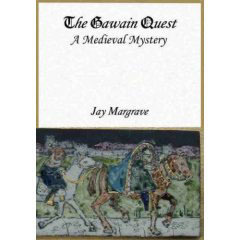 The Gawain Quest is the first in a trilogy of mystoricals involving Priedeux - a character who changes the course of history. In The Gawain Quest, Priedeux is a medieval hitman. He is sent to kill the writer of the poem, Gawain and the Green Knight, to stop further seditious texts against the King, Richard II. As he follows the clues in the poem, Priedeux finds himself questioning the very purpose of his vocation. Can he discover the identity of the mysterious author in time to stop rebellion and save his own life? And what will he report to his master, John of Gaunt? In the second book of this exciting trilogy, Priedeux becomes the companion and mentor of the scheming Anne Boleyn in Luther's Ambassadors and, jumping through history as a fictional character is allowed to do, he travels with Christopher Marlowe through Europe, after his supposed death in Deptford, in The Nine Lives of Kit Marlowe.